If you’re traveling to Staten Island for some reason this year, there are some new, chic shopping locations springing up in the Forgotten Borough, and no shortage of spectacular Italian food for you to sample. While the Island has its rough edges, we have been visiting for years and have always found that the excellent dining options smooth them all out – in fact, I’ve never had a bad meal on Staten Island. 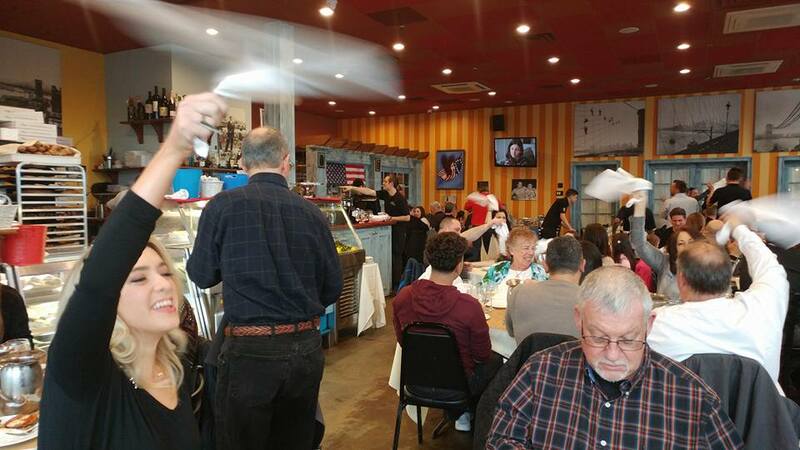 Recently, I visited Patrizia’s, on Amboy Road in SI’s Eltingville neighborhood, and my impression of the Island’s superiority in Italian restaurants was reinforced. This strip mall outlet of the Brooklyn-based, family-owned mini-chain was bursting at the seams already at 6 p.m. on a Saturday, and by the time we left, there were probably 25 more families just waiting for a table. It’s tough to inspire a fan base like that in today’s crowded restaurant market, but our dinner at Patrizia’s proved to be waiting-in-line-worthy. You’re most likely going to notice two big components of having a good time at Patrizia’s before your first course even arrives at your table. First of all, this restaurant has maybe the coolest, most raucous birthday procedure ever. At least nine times during our meal, a loud birthday song came over the speakers in the dining room, and patrons twirled their napkins in the air at just about every table as the wait staff sung along to the guest of honor. It was incredibly fun and fostered a familial atmosphere in the room. When a patron at a neighboring table thwacked me in the head with his napkin, I even hugged him. Second, that wait staff is almost entirely comprised of charming young men straight from Italy. They speak Italian and have charming accents, and if that doesn’t set the scene for authentic continental fare, I don’t know what does. As one of the members of our party was a vegetarian, we started our meal with the buffalo mozzarella with caponata and cherry tomatoes. But before that dish even came, we received a big basket of crusty bread with wonderful, seasoned dipping oil and a family style salad made with mixed greens plus red onion, carrots, tomatoes, and cucumbers so vibrant they may have been rendered in Technicolor. Passing that salad around the table immediately underscored the family feel – what a smart way to have every table feeling the love straight away. The demi-lunes of buffalo mozzarella on our appetizer plate were achingly fresh and milky, while the caponata – a mix of roasted and marinated red bell peppers, onions, zucchini, and eggplant – was sugary sweet and velvety. Fresh cherry tomatoes tossed with olive oil and seasoned with salt and pepper completed the plate and added a different note of both sweetness and acidity. This was a big platter of treats, too, not some skimpy, three slices of cheese and a quarter cup of veg affair. There was plenty of stunning food for all five of us. After another rousing rendition of the birthday song, our entrees arrived. Among the standouts were the house made potato gnocchi with pesto. Gnocchi are often described as pillows, but these really were ethereal and lighter than air – soft puffs of earthy potato enrobed in a verdant green sauce smacking of fresh basil and anchored by the nuttiness of good parmigiana cheese. Of the dishes we ordered, this one may have been the most simple, but the vegetarian of our group found it ticked all her boxes for a successful dish. On special the night we dined at Patrizia’s was a squid ink linguine with seafood and olives in a light red sauce. This gorgeous dish was colorful, soulful, and jam-packed with massive shrimp and smaller clams. The seafood was perfectly cooked and bursting with the salinity of the sea, while the tomatoes were bright and acidic and the black and green olives provided earthy flavors. The pasta, house made with squid ink, was jet black and while not fishy at all, underscored the oceanic notes of the dish. Spaghetti all’ amatriciana is a simple Roman dish comprised of a sauce made with tomatoes, onions, and bacon. I’ve made this sauce myself, which is both hearty and light, as the tomato base tends to be rendered with fresh tomatoes rather than a long-cooked, paste-enriched gravy. This was hands down the best version of it I’ve ever tasted. The sweetness of the onions, the saltiness of the pancetta, and the sweet/sharp flavor of fresh tomatoes all mingled perfectly in the chunky sauce to bathe the al dente spaghetti in huge flavor that hit every taste bud with a punch. I would order this dish time and time again. We just had to segue straight into the dessert portion of our evening. Our two favorites were the zabaglione, a creamy, cold ice-cream-like dish of custard flavored with marsala wine and topped with raspberry sauce. The zabaglione was light in texture but rich in flavor, and not too sweet – a perfect ending to a decadent meal. The panna cotta was also very light, but this one was topped with chocolate sauce and powdered sugar. We loved its silken texture and creamy finish on the palate, and it wasn’t too sweet, either – just perfectly balanced between milky and sugary without going overboard into toothache territory. One of the most spectacular attributes about all our food at Patrizia’s was the visual feast every single dish provided in addition to its taste. The colors were vibrant and alive on each plate – this is no standard red sauce joint. The other commendation was the atmosphere, which was almost electric in feel, but still, somehow, relaxing. Many trendier, big city restaurants have turned the lights way down and the music way up to achieve a night club-esque feel in the name of ambiance, but here, it’s all about family. The dining room was bright and open, and between the birthday celebrations erupting every few minutes and the jovial disposition of every single member of the wait staff who visited our table (there were at least five throughout the meal), we felt welcome. There isn’t much hospitality left in the hospitality business these days, but Patrizia’s, in Staten Island, is serving it up in spades.